The standard reference for military lockers used for individual secure storage applications, gear lockers, and standard storage lockers is TA-50 lockers. TA-50 is the standard issued gear for soldiers, such as Load-Bearing Vest, Assault Pack, Ruck Sack, canteens, poncho, Advanced Combat Helmet, etc.... See pictures of the equipment typically stored in TA-50 lockers. Military style lockers are not just for the military though. They are storage lockers and thus are suitable for storing any items you would like to securely store. They come in welded wire or expanded metal heavy gauge steel. There are many internal options available such as shelves, hooks, additional internal secured areas, with or without back panels, you can define the options your application may need. Military lockers are meant to be highly secure and highly visible. CSI provides TA-50 military lockers for individual secure storage applications. 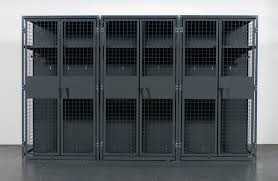 We also offer Security Cages, Visibility Storage Lockers, Bulk Storage Lockers, as well as Tenant Storage Lockers. If you need more space within a limited footprint to incorporate your storage locker needs consider a Structural Mezzanine. Remember our professional installers for your storage locker installation project.